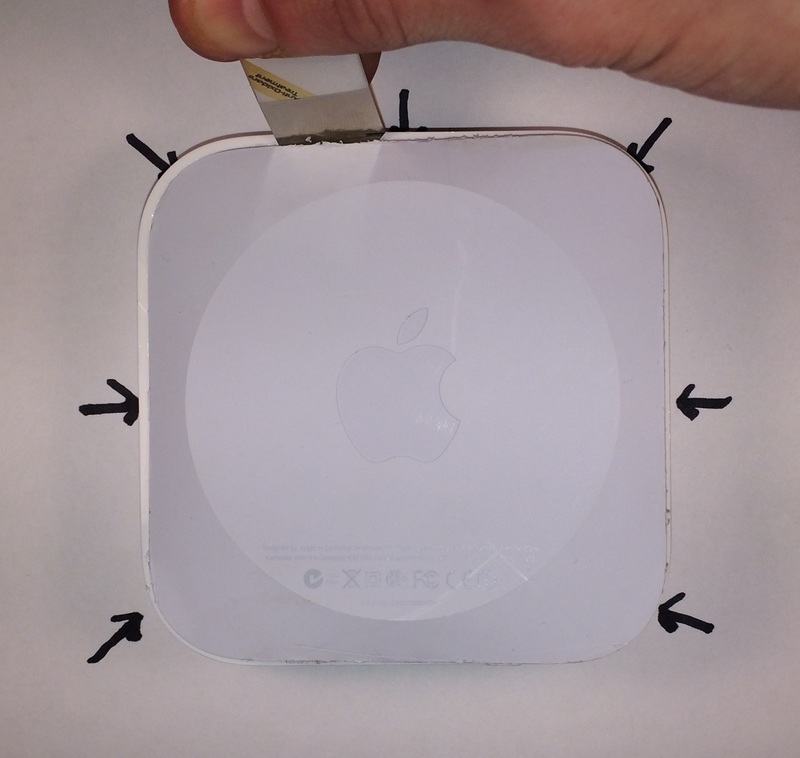 I became interested in exploring the AirPort family of routers a few weeks ago, after learning of an easily accessible serial port on the AirPort Express 2nd Generation N router (thanks to Chris, a.k.a. capin for sharing the discovery). While searching for information about this device, and the rest of the AirPort family, I discovered that there really isn’t that much out there. There are just a few blog posts and teardowns available on the web with virtually no discussion of custom firmware builds, hacks, or other in depth analyses. Out of the desire to explore something yet unknown, I picked up a couple of routers. This post documents some of my findings and thoughts on what could be done next with these devices. I currently only possess the 2nd Generation N model of the AirPort Express; more posts may come when I’ve acquired more hardware to investigate. The logic board and the power supply are the only two modules inside. 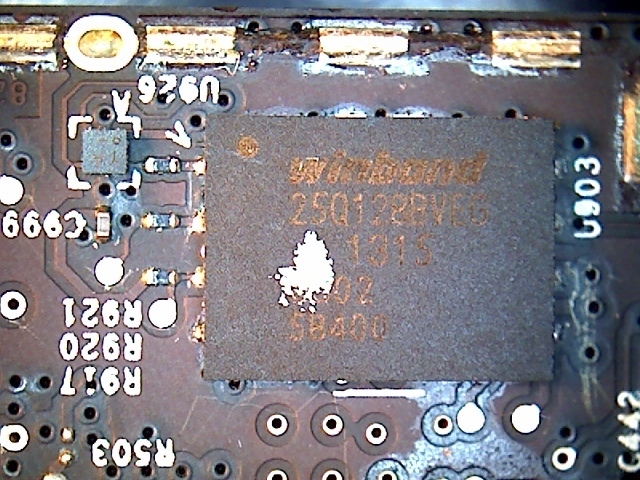 The logic board is held down with Torx T8 screws. There are two Torx T6 screws fastening the power cord connector in place. Removal of the logic board is not strictly necessary to access the debug header, though it may make soldering to the test pads easier. 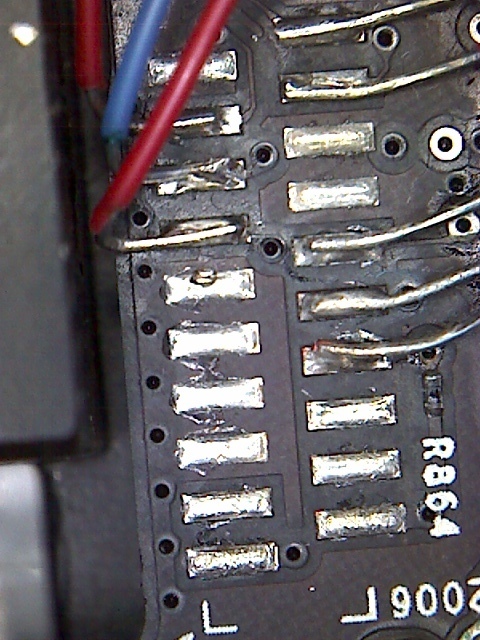 Two of the pads are connected to the onboard low-speed UART. 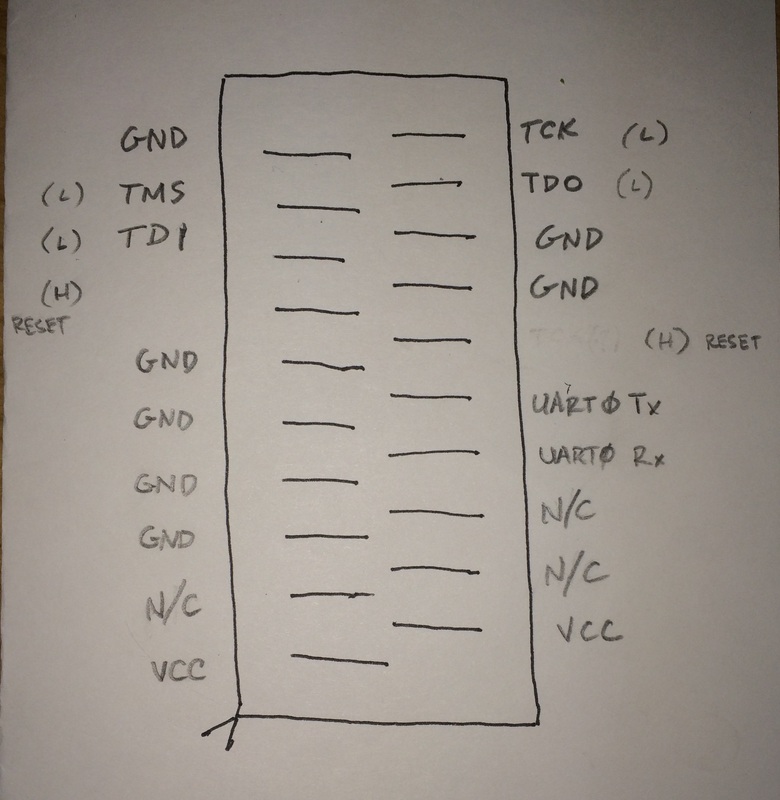 I used a FT232RL adapter to interface with the port, and connected with screen (115200 baud, 8 data bits, no parity, 1 stop bit, no flow control). A root shell is available immediately requiring no authentication. CFE is used for the primary bootloader. The bootloader initializes the system and reads the scfg partition to populate some environment variables. The CFE console can be accessed through the serial console by pressing a key shortly after boot. Several useful commands are available including the aforementioned memory read/write commands. After a one second timeout the default boot commences. The device runs a NetBSD 4.0 kernel. The kernel (along with the root filesystem) is stored as a gzboot image. The gzboot image is a self-loading gzip compressed image, similar to a Linux zImage. The stub loader is executed directly from SPI flash, which decompresses and loads the image contents to DRAM, then jumps to the kernel entrypoint. The root filesystem comprises one monolithic binary as well as assorted scripts and configuration files. All of the system binaries are, in fact, hard links to this binary, named “crunchprog”. Contained in crunchprog are standard system and networking tools, as well as several proprietary daemons for Apple services. These include Bonjour, Back to My Mac, AirPrint, AirPlay, and AirPort Utility configuration. The dcfg partition is mounted at /mnt/Flash, and provides keys and configuration data used for device configuration on startup, as well as for updates from the host through AirPort Utility. Firmware updates are distributed from Apple as basebinary files. The basebinary is simply a container and its contents are encrypted. The file header contains a magic string, an integer representing the product ID of the device that the firmware targets, and several more bytes of unknown function. The Adler-32 checksum of the basebinary is appended to the file. AirPort Utility checks http://apsu.apple.com/version.xml for updates. When updating the device’s firmware, both the basebinary and a signature file are downloaded to the host. The firmware update is verified before it is sent to the device. It is verified again on the device, then unpacked and written to flash storage. Finding JTAG was the goal to reach before stopping to publish a summary of my research. 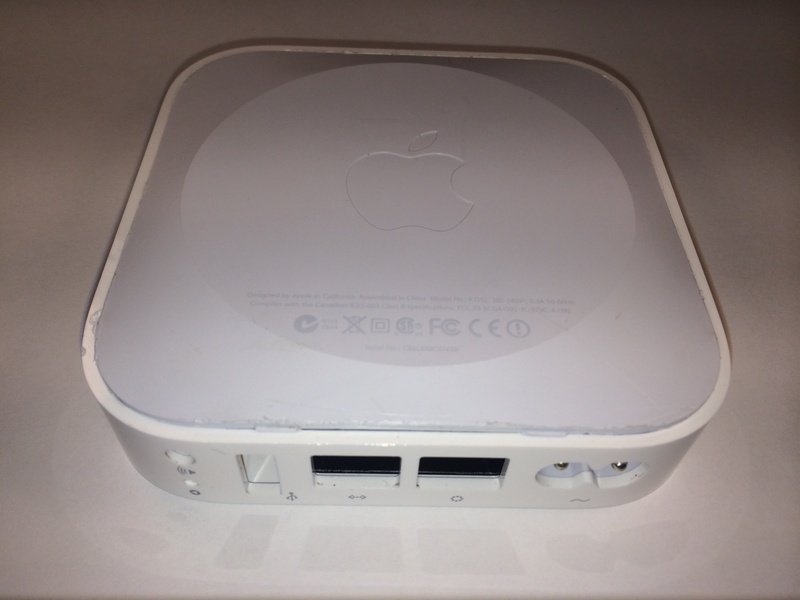 With the serial console and JTAG interface available, it is possible to develop and hack on this AirPort Express with essentially no fear of bricking the device (provided backups of flash contents are acquired first, in the case that CFE and both gzboot images are damaged). This opens a few avenues for further research. Access to the device over something other than a serial interface would be very helpful for tinkering with the device. An SSH server is available, however not configured to run by default. Setting up SSH over the serial console is possible without copying anything to the device, either using ssh-keygen or borrowing the SSH host keys present at /mnt/Flash, and providing a basic sshd_config (and also adjusting the firewall with pfctl). This setup is not persistent because the root filesystem is backed by a ramdisk refreshed at each boot with the filesystem image stored inside the gzboot image. Persistent access to the device will require modifying the ramdisk contents with a new configuration and writing them in a new gzboot image to flash. Considering the variety of proprietary services running on the device, an audit of the kernel and crunchprog binaries should be performed. Many of the services allow local or remote access to the device using undocumented protocols. A cursory examination of the system shows a lack of hardening, with the likely consequence of compromising one of many daemons being full control of the target device. In order to bring together those interested in hacking the AirPort family of devices, capin established The AirPort Wiki. The goal of this wiki is to document device internals, and lay the groundwork for adding new features to the device, or possibly porting a custom firmware. More technical details of my research will be added to the wiki as I have the opportunity to assemble and publish them. There is an associated IRC channel, #theairportwiki on Freenode, for the discussion of hacking AirPort devices.